apportée dans ses rapports avec eux. hieroglyphic semblant a l' chiffre 9. Alexander McKenzie employed in the Indian Department as Interpreter and Messenger to the Pottawatomies of St Joseph's and the Neighbouring Villages, Having left Detroit where I found Pepan and Baptiste SansCrainte inhabitants of the settlement of Detroit they informed me they had just arrived from Fort Wayne and that the only News there was the intention of the American Army to come to Detroit on the Opening of the Navigation in the spring I prevailed on those two to come with me to Kekalamasoe Burrell's where I met an Indian Chief of the Chippewas called the Bad Bird he had been at Fort Greenville and returned hither with Pepan and Sanscrainte His information to me was that Williams and Zeans with a few Wyandot from Sandusky were with General Wayne when he was there and that Williams in Council spoke as follows, " We have come from Sandusky to see you or Brothers and to give you our hands and to let you know we are the first Nation and the commanding Nation And that we can bring all the other Nations here to make a general peace with you we have come to remain with you Brothers and you will point out to us a place to sit upon until you rise or want our help We will send for all the other nations to come and make a final peace we will assist you against the English the Governor and the White Elk or any Forces that may come against you or any of the Nations that refuse to join us"
at Detroit. In 1789 he was made a member of the Land Board of the District of Hesse. Dummer Powell, 163; Thwaites and Kellogg, Revolution on Upper Ohio, 74-75; Mich.
Pio. Colls., passim; and mss. in Burton Hist. Coll., passim. decade longer he continued to lead, or encourage, the western Indians in their warfare with the Americans, but this phase of his career was definitely closed by Wayne's victory at Fallen Timbers and the peace which followed it. Save for a considerable period of exile during the War of 1812, when the Americans were in control of Amherstburg, Girty continued to reside here until his death, Feb. 18, 1818. For an exhaustive account of his career see Consul W. Butterfield, History of the Girtys . . .
 Book of McKee, p 157, pg 430 states: "Charles A. Hanna in his The Wilderness Trail surmises Thomas McKee's wife to have been white." Bishop Cammerhoff, a Moravian minister, states in his journal: "January 12, 1748. . . at nine o'clock we reached Thomas McKee's , the last settlement on the river below Shamokin. . .His wife, who was brought up among the Indians, speaks but little English.. . .He is recovering from a serious sickness and is still feeble. . .he also asked Powell to request me to baptize his child on my return." She was probably raised by Shawanoe Chief Kishacoquillas, who died at Thomas McKee's place in the summer of 1754.
pg 435 states: "I have the entire account of how Thomas McKee was captured by Indians in the Western part in Virginia. She [his later wife] understood their language and heard them plotting to kill Thomas. She went to him and told him she would help him to escape if he would take her with hm and marry her. Thomas McKee with her rode 48 hours without stopping and as we know in the family he married a white woman we presume this was she....Thomas McKee evidently did not regard his connections with Indian women as legal marriages...I have a number of family letters never published in which Alexander addresses James as brother. Also the Authorities of the day acknowledged James as the legal son of Thomas and gave him all the land Thomas had owned....My mother knew very well her grandfather Alexander McKee who was the son of James McKee...and he told her this family history and also said that James had said his mother was a white woman...Mary McKee (wife of Captain Thomas McKee...) could only make a mark for her name...there were at least 6 children by Indian women." Page 438 states: "I Mary McKee, Widow and Relict of Thomas McKee late of Paxton Township in the County of Lancaster Yeoman Deceased do hereby Relinquish all my Right of Administration on the Estate of my said Late Husband and do agree, as far as in me lies that letters of Administration be granted on the said Estate to my son Alexander McGee." the rank of deputy agent, and subsequently became superintendent of Indian Affairs at Detroit. Charles Mounts Anderson, early explorer and operator of an Indian trading post on the Monocacy River near present-day Frederick, Maryland, was asked by the Maryland Assembly to provide a meeting place at his home for a council with a local Indian tribe. A John Powell was charged with inviting the Indians, and was "to go to Shuano town on Potomack, commonly called Opessa’s Town”; he was provided calico shirts and scarlet worsted stockings to be used as gifts to help induce the Indians to attend. The purpose of the proposed council was to negotiate with the Shawnee over returning slaves they had been harboring - but the Shuano (Shawnee) Indians chose not to show up on the appointed date, and Anderson’s partner Israel Friend was sent back to invite them to visit Annapolis instead (Archives of Md, vol. 25 p 443, 451). Opessa’s Town is now called Oldtown, located on the Potomac River between Hancock and Cumberland, Maryland, about 50 miles west of Shepherdstown. Charles Anderson had been in the Indian trading business since at least 1712, when he was recorded as entering into a lawsuit in Cecil Co, Maryland, with the widow of Indian trader Jacque LeTort, who lived at the Indian town at Conestoga, Pennsylvania (see Diller, n.d). Charles Anderson had been involved with negotiations over these same slaves since at least 1722 when the Maryland Council, hearing he was in Annapolis, had asked him to go to the Shuano town (Oldtown) with gifts of coats and socks, and a promise of a "chain of friendship" for "so long as the sun and moon shall endure," especially if they would give the slaves back (Md Archives, vol 25, p. 395). Ypsilanti Gleanings is the official publication of the Ypsilanti Historical Society. Over its nearly 40 year history, Gleanings has grown from a simple newsletter to the scholarly publication it is today. Through painstakingly-researched articles, first-hand accounts, and historical photographs,Gleanings presents a clear picture of the Ypsilanti that once was and still is all around us. It also serves as a document of the Ypsilanti Historical Society itself and its growth from a small band of devoted historians into the distinguished museum and archives it is today. Start exploring this online archive of Ypsilanti Gleanings by searching, browsing by issue or browsing by subject. You can also take a look through our Ypsilanti Gleanings Image Gallery of photographs and illustrations from the collection of the Ypsilanti Historical Society. and I realized that there was "Truth" to the stories, Sans Crainte was a famous Interpreter (more so the father). 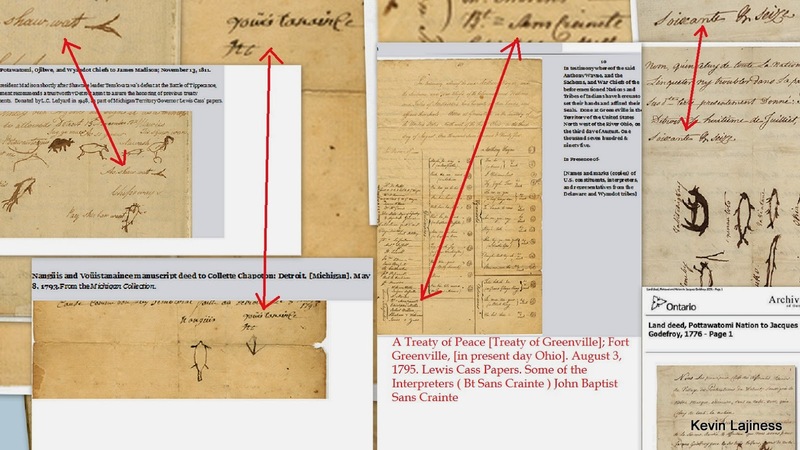 The father probably the one that had signed the Treaty of Greenville, the son and father had much influence with the Indian probably because the grandmother Margaret Descomps dit Labadie Married Claude Solo (1732 - 1799), Jan 22, 1759 and died Apr., 1765 . 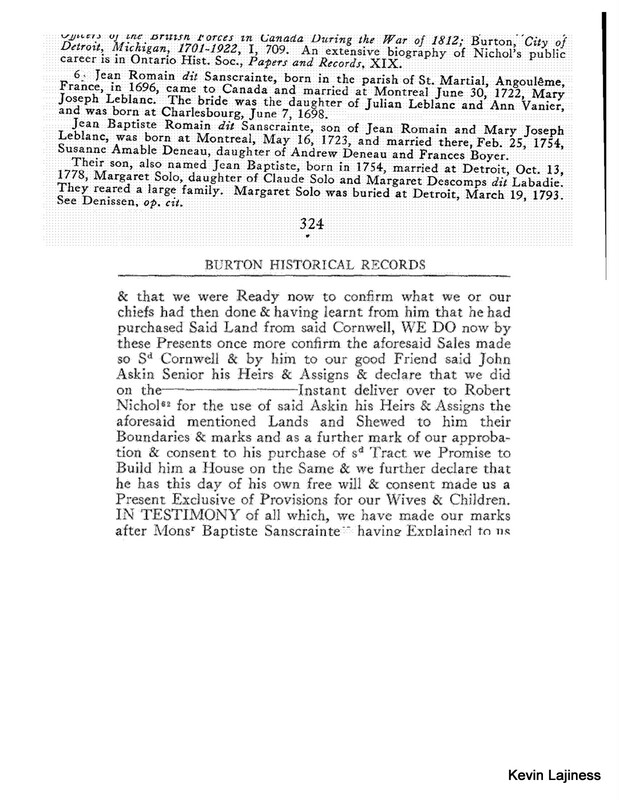 She Died When his wife (Margaret Solo b 3 May 1761), Is said to have resided at Coast of the Pottawatomies (Denissen), was only 4 so she was raised by her Father Claude Solo second wife was raised by her step mother who was a Sauteuse Indian and she had a stepbrother by her. Anyway to get back to the story. My father also told me of the story of Pierre Roy and that he was at Detroit before Cadillac, he even told me driving down I 75 from Detroit one time as a child "There that Island, the one just south of Belle Island, That is where our family comes from. remember this was a long time ago and we were poor and did not travel to go to library to study this and my Dad grew up during the depression, the only time he got out of Luna Pier Mi was to hitch hike to Catholic Central high School in Monroe. even his dad Preston Lajiness walked to Monroe down the tracks to work when he wasn't walking them to pick up coal that fell from the coal cars. So when i found out that everything he had said, and I'm still finding out, has been true, where i find discrepancies i dig tireless to prove them. In your article "Have NO FEAR; J.B. Sanscrainte was here!" You write "Until the Fall 2009 publication of GLEANINGS, most readers were content in their understanding that Gabriel Godfroy was the first European to settle what is now Ypsilanti. All that has changed as..."
"When Karl Williams was a student in EMU’s Historic Preservation Program, he noted in the Fall 2009 GEANINGS, “As indicated in Hugh Heward’s 1790 journal, Gabriel Godfroy was both aware and involved with the trading post established by Jean Baptiste Sanscrainte at Ypsilanti as early as 1790…” As You can see I Published that and more including the Sans Crainte timeline at my blog "Indian Trader and Interpreter: In 2020 Ypsilanti" http://indiantraderinterpreter.blogspot.com/2009/05/in-2020-ypsilanti.html This was in May obviously before fall when everything changed, I bring this up for two reasons, one, since I am outside of academia and have problems with English i am often overlooked and I makes it that much harder to access information. In that spirit it has come to my attention of another claim that the story of "Without Fear" "Digging deeper: Ypsilantian Michael Van Wasshnova, a history buff and member of the Monroe County Historical Society, relayed our “Sanscrainte” story to his compatriots in Monroe who said, “Certainly! Sanscrainte was a promotional alias Jean Baptiste had adopted to further his trading in the American wilderness.” His real name, they reveal, was actually Jean Baptiste Saint Romain." This i find to be totally without Merit!!! Bt Sans Craint as he was known did not in any records I have seen have Saint in his name regardless of where he came from as for the self promoting, he did not have to do that he had influence over tribes of Indians as well as his father. My father said The Indians called him Strong man without fear and it is a mater of fact that this was undoubtedly true in Dappers records when he was begged to go to the falls with Pontiac's son, Dapper himself not favorable to him remarks how he was a big and imposing figure, It is said he saved many life during the war of 1812 and with his influence on the Indian and If there is any Doubt that he was not a strong man without fear as a Boy of eleven he and his father helped set up missions all through out western Lake Erie where only rugged men and Indians ruled. Something to note , i have taken a brake from my Genealogy for years to write 300 songs but when i was into the thick of it I studied the first hundred at Quebec and realized they were all almost related, in fact the first permanent settler in Canada Louis Hebert, Champlain's apocrathy, also my ancestor is the father of many that came to Detroit Via the Fur trade and The Jesuits to set up missions and those people part of the Fur trade Dynasty married within that Dynasty as it happen Pierre Roy first at Detroit and Sans Craint at Monroe and many more it is no wonder they are both ancestors, this and a dime will get you a cup of Joe, Not. But for me to Justify an existence, to give reason, to tell the stories and pass them unmolested, and the greatest reward to find that men of Courage and substance place a cross, over looking a cliff, that they say is the most beautiful spot in all of Canada and for me not that it bear at the foot a coat of arms to claim the land but for what that cross represents. Thank You Kindly Happy Hunting Kevin C Lajiness , edit some mistakes 3/15/2015, sorry wasnt fresh and some of it is confusing, may have to edit again. This is a serious Blog about real people that were Indian Interpreters from the Detroit, River Raisin Area of Michigan and some from Pennsylvania , I focussed on my ancestors. Their ties to each other, their relationship with the natives that they joined, intermarried and traded furs with. The Songs and artwork are mine,The color chart and genealogical chart were developed by me, included with my work is a index with links to other informative sights. 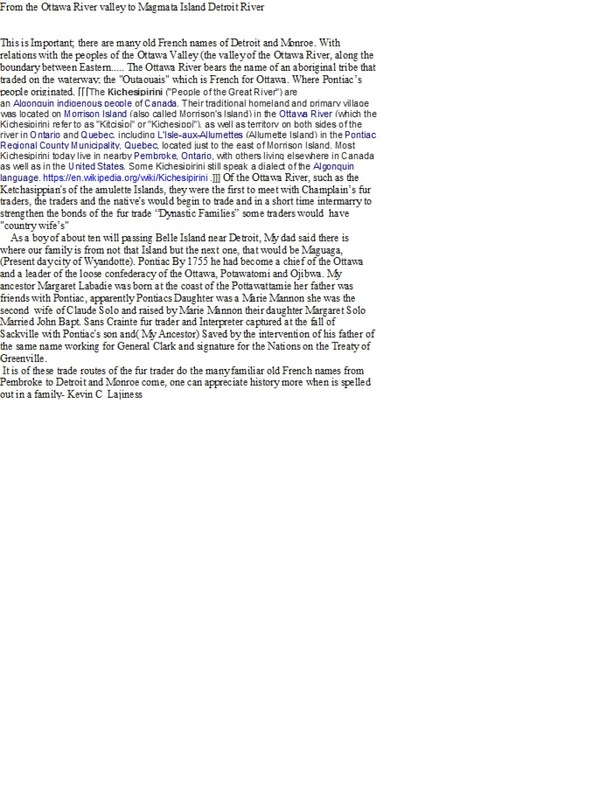 most of it can be found just below by clicking on the Blog Archive for 2009 you can refine your search from there. KevinLajiness's Channel‏ - (YouTube) by Kevin Lajiness is licensed under a Creative Commons Attribution-NoDerivs 3.0 Unported License.